Rajeev's World: The Romance of the Monsoons! 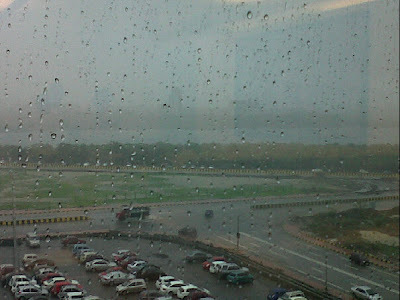 And finally, this year, the Monsoons are here! Only a few days back, Bombay was (a bit too) warm, bright and sunny with nature at very best, gaily showing off its vibrant colours, in its full splendour! 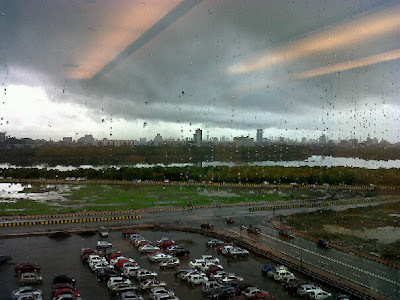 While the skyline out of my office window looked bright and quite a bit impressive, we, in the city, were all worried. With the lakes supplying water to this megapolis running dry after last year's Monsoon debacle, it had become essential that the weather lived up to its reputation to ensure a full year's water supply. And just before the alarm bells started clanging hard, the Monsoon did indeed keep its annual date with the city, this year at least. After an overcast sky, with clouds floating around ominously, the rain did finally start pouring yesterday! And before we could realise, it started pouring. The temperature started tumbling down, the sunlight blocked out for God knows how many days. And the green started looking even more vibrant! As I look of my office window during the day, the beautiful sight outside beckons me, the green beckons me. As the rain began to pour, the intensity of the downpour increased, I remembered Forrest Gump's dialogue on the Monsoon in Vietnam, which says: "One day it started raining, and it didn't quit for four months. We been through every kind of rain there is. Little bitty stingin' rain... and big ol' fat rain. Rain that flew in sideways. And sometimes rain even seemed to come straight up from underneath." 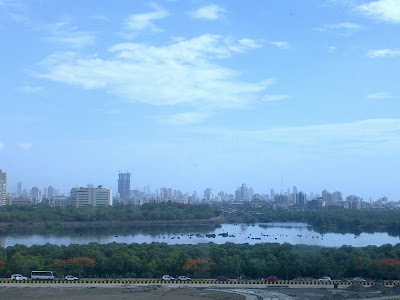 If there's one season that stands out in the city, it is the Monsoon, the season that brings out the best the city has to offer, whether it's nature or spirit of human endurance, an extreme example of which we had witnessed in 2005! A wish which I always had is to get out in the rain and dance like the way Shahid Kapur did in the movie, Jab We Met! The romance of the Monsoons is here!